CLAREMORE, Okla. – By the time Chris Kirby is ready for bull riding at the Will Rogers Stampede, he will already be drenched in sweat from a full night’s worth of work tackling many of the behind-the-scenes duties that are involved in producing an event of this caliber. It’s OK, though. It’s something in which Kirby takes great pride. You see, the Kaufman, Texas, man is a professional bullfighter who will work alongside Clay Heger of Odessa, Texas, in keeping fallen bull riders out of harm’s way. That is their main job at Claremore’s rodeo, with three performances set for 7:45 p.m. Friday, May 24-Sunday, May 26, at Will Rogers Round Up Club Arena. But they have many others with Pete Carr, owner of Carr Pro Rodeo and Pete Carr’s Classic Pro Rodeo, which will be providing livestock in Claremore for the first time in the rodeo’s 67 years. “I’m just doing something I love to do,” said Kirby, 31. Kirby will be in charge of hauling some of the best animal athletes to Claremore. Once on site, Kirby and Heger will work with other crewmates and members of the volunteer committee that produces the annual rodeo. “We have a family atmosphere, and we all know what to expect with each other,” Kirby said. “I’ve just kind of jumped in there. If there’s a void that needs to be filled, I just go with it. We all try to make sure that what needs to get done gets done. It’s a smooth deal. A longtime athlete, the Texas-born Kirby likened it to another professional sport. “It’s no different than the Dallas Cowboys playing,” he said. “When they’re in the huddle and the play is called, everybody’s supposed to know their situation and know what they’re supposed to do. The offense drives down the field, and you score, just like you’re supposed to. Kirby grew up competing in more traditional sports like baseball and football. His family cared for livestock, so he’d been around horses and cattle all his life, but it wasn’t until his early 20s that the man learned why rodeo gets in one’s blood. That was a decade ago, and he’s been doing it ever since. In fact, he began taking it seriously just five years ago. In 2010, he became a member of the Professional Rodeo Cowboys Association, the top sanctioning body in the sport, and got involved with the Carr crew. “It’s a job I get paid for that I really enjoy,” Kirby said. “I never really looked at it like it’s a dangerous job. It’s just what I do. And, really, I’m just as safe in that rodeo pen as if I’m driving down the highway. 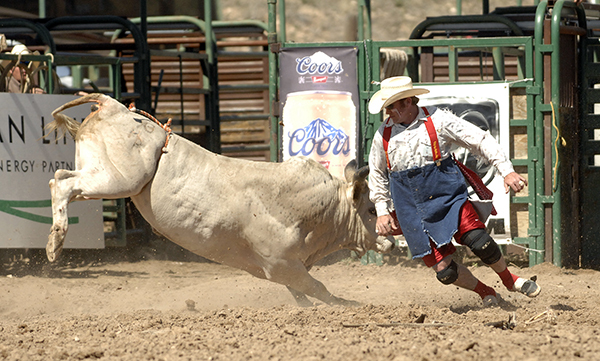 Still, not many others get a chance to look in the eyes of a bull toting nearly a ton of kicking, spinning muscle. As a bullfighter, Kirby moves in once a bull rider comes off the animal, battling to get the bull’s attention, then using his natural athletic ability to get himself and all others in the arena out of harm’s way in the blink of an eye. “It’s exhilarating,” he said. “It’s everything about it. It’s truly sensational to know there’s a wild animal right there that I’ve got a hold of that’s going to follow me wherever I go. While he works in front of thousands of fans at any given rodeo, Kirby tests his night on how little he is recognized in the arena. If he’s doing his job well and everybody stay’s out of harm’s way, then a bullfighter goes unnoticed. That’s his goal in Claremore, but that’s also his “working behind the scenes” personality.